Ecologist studying fine- and coarse-scale drivers of plant endemism. At the population level, I study differences in seed dispersal effectiveness for related endemic and widespread species using field and laboratory techniques. At the landscape level, I use ecological niche modeling to predict species ranges and identify abiotic drivers of endemism. Endemic species are key components of global biodiversity and have been shown to contribute disproportionately to the functional stage of species assemblages, and thus the maintenance of ecosystems. Therefore, understanding the underlying processes affecting endemism and rarity is a critical aspect of ecosystem conservation. Endemic species play starring roles in conservation planning and are often of particular interest to the public. In addition, endemism is of great interest in the field of rare species biology. Discovering why some species are rare while others are common is central to our understanding of the dynamics of species and communities, and is a fundamental question in ecology. In flowering plants, aspects of rarity and commonness may be associated with dispersal syndromes. To test this hypothesis, I compare seed dispersal effectiveness (SDE) for co-occurring endemic and common congeners of Trillium, perennial understory herbs found throughout deciduous forests of the southeastern US. Trilliums are myrmecochores (their seeds are dispersed by leaf litter ants), so I quantify metrics of ant-mediated seed dispersal observed in the field and measured in the laboratory to determine if aspects of SDE differ for endemic-common Trillium ​species pairs. In ants, preference for food items can be detected through "cafeteria" experiments where two items are offered simultaneously. In myrmecochorous ants (those that disperse seeds), preference is likely shaped by physical and/or chemical attributes of seeds, including weight, length, width, or the ratio of elaiosome (a seed-coat derived appendage) to seed. 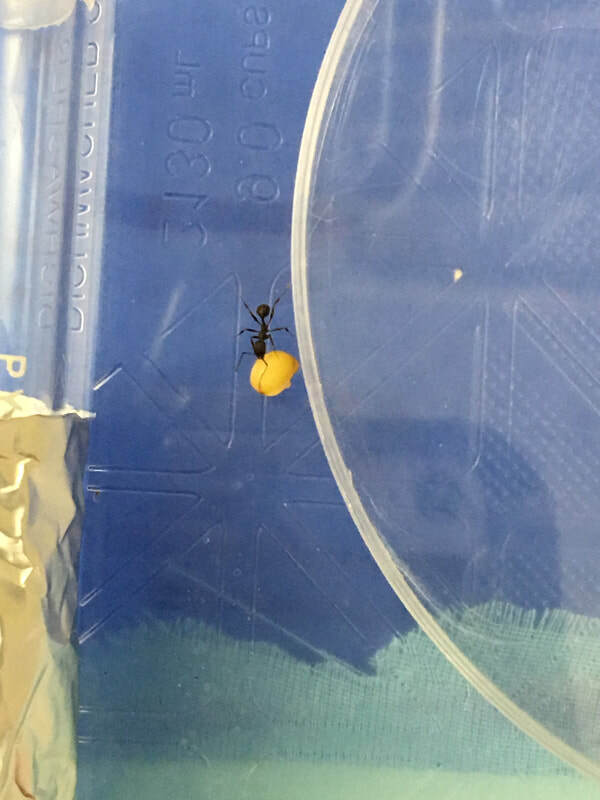 Chemical cues, particularly oleyl-containing compounds, stimulate ants to carry food items to nests and have been shown to explain ant preference for myrmecochore seeds of low nutritional value. However, nutritional quality likely also impacts ant preference. To test whether ants display a preference for endemic or widespread Trillium congeners, I perform cafeteria experiments using captive ant colonies. To parse out the underlying mechanisms driving preferences, I use gas- and liquid-chromatography mass spectrometry to characterize seed chemical profiles. In addition to parsing out fine-scale ecological differences between endemic and widespread Trillium species, I test questions about landscape-level processes that impact geographic range sizes using Maxent environmental niche modeling.